Simple Fried Hokkien mee recipe. To start with, there are two types of Hokkien mee, which are Hokkien hae mee and Hokkien char mee. 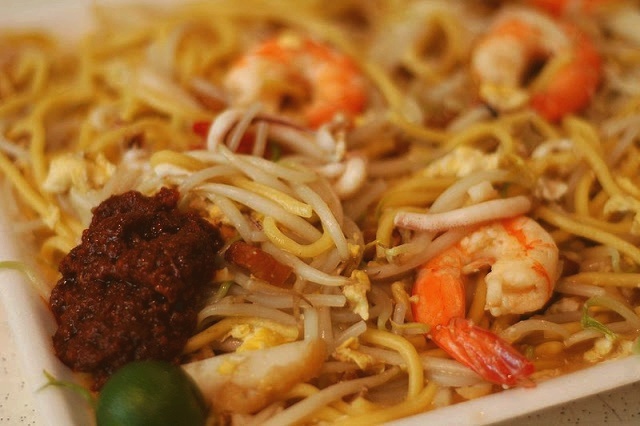 Hokkien hae mee (Hokkien prawn noodles) is commonly served in Singapore while Hokkien char mee (Hokkien fried noodles) is commonly served in K.L, Malaysia. The dish commonly referred to as "Hokkien mee", depending on the locality, can mean either Hokkien hae mee or Hokkien char mee. For example, Hokkien mee in Kuala Lumpur refers to Hokkien char mee. 1/4lb rice-flour noodles or "laksa mee"
In a medium wok, fry the Hoklkien noodles and the rice-flour noodles with 1 tbsp oil with 1 beaten egg over high heat until fragrant but do not overcooked. Put aside. Clean wok. With a clean wok, add 1 tbsp oil, saute minced garlic and remaining 1 beaten egg till fragrant. Put the mixed fried hokkien and laksa mee and stir a bit. Add 1 tbsp of water and stir the contents continuously for about 30 seconds. Add chicken oil, salt, oyster or Hoi sin sauce and soya sauce. Sitr over high heat for a few seconds and add another tbsp water. Cook a further 5 seconds then add the prawns, chopped squid, Chinese chives and turkey bacon. Cover with lid and cook for a few more seconds until everything is thoroughly heated, then serve immediately. The final dish should resemble somewhat like a wet fried noodles. Garnish with sambal chilli and lime. Wow, looks tasty. Eid Mubarak is coming near and halal is very important. There’s turkey bacon in your recipe. I don’t think this is a halal recipe. Do revise, thanks. Yes there is halal turkey bacon.. can easily find them at Giant supermarket.